Tron was my first graphics game in high school finished in '90. 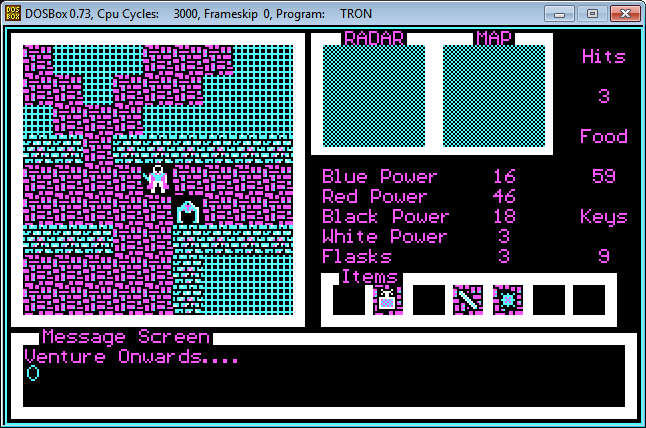 It was written in Turbo Pascal with CGA graphics using a 286. I had to write my own editors - graphics, map, item. All of it was self taught since nobody I knew could program. I basically had to "reinvent" things like sprites. I also wrote two text adventure games for the Apple IIe in Basic before attempting my first graphics game. 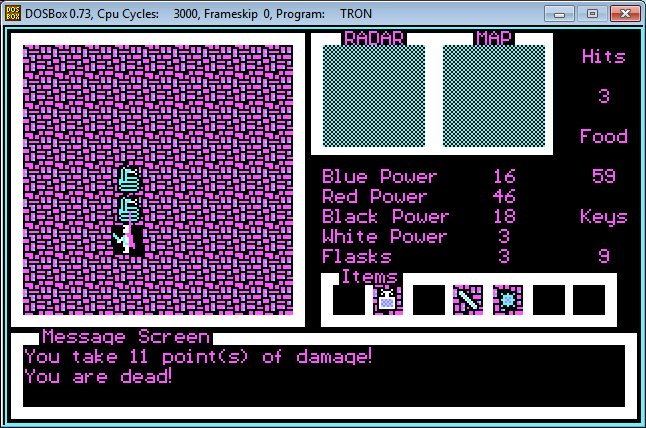 The game is loosely modeled after Ultima ][ on Apple IIe but using the Tron universe. The player can ride vehicles (LightCycle, Intercepter), battle monsters, ride across the grid, explore IO towers (towns). The goal is to defeat the MCP by finding keycards to reprogram and destroy it.